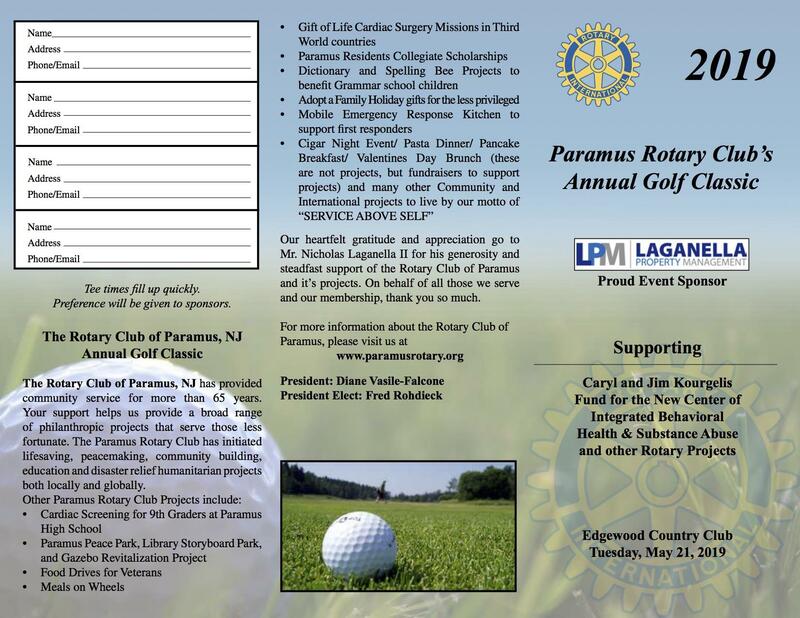 The Paramus Rotary Club Annual Golf Classic is being held at Edgewood Country Club on May 21, 2019. This year the event will benefit the Caryl and Jimmy Kourgelis Fund for the New Center of Integrated Behavioral Health & Substance Abuse. Please join us in supporting this important Charity along with many other Paramus Rotary Club Projects. For more information, please see the attached brochure or call Richard Siniscalchi at 201-618-9010 or Mitch Saferstein at 201-819-6432. Thank you for your generosity, support, and participation to make this a great event for Jimmy and Caryl and for helping to mitigate the epidemic that is plaguing our country now surrounding substance abuse. Now that the warmer weather is finally approaching we will all have the opportunity to bask in the sunshine. There is no other way to enjoy the great outdoors then with friends playing golf while raising money to help others in need. We will once again hold our Annual Golf Classic at the Prestigious Edgewood Country Club, on Tuesday May 21st, 2019. Our club has held its annual outing each year for over 30 years and some of you may be aware that the chair of this event for many of those years was our very own dear friend and Rotarian Jim Kourgelis. His selfless efforts through this event have raised hundreds of thousands of dollars to support our many projects and charities. Therefore this years event theme is "Charity Begins at Home" as we will continue to raise money for our many worth while causes, this cause has affected many around the country and most of all right here in Bergen County. The opioid crisis has become an epidemic and it does not discriminate, therefore the proceeds of our outing will support "The Caryl and Jim Kourgelis Fund" for the New Center of Integrated Behavioral Health & Substance Abuse. This center will be located in Bergen County and will provide the assistance and resources that we as a community so desperately need. The life you can help to save may very well be that of a friend or loved one. 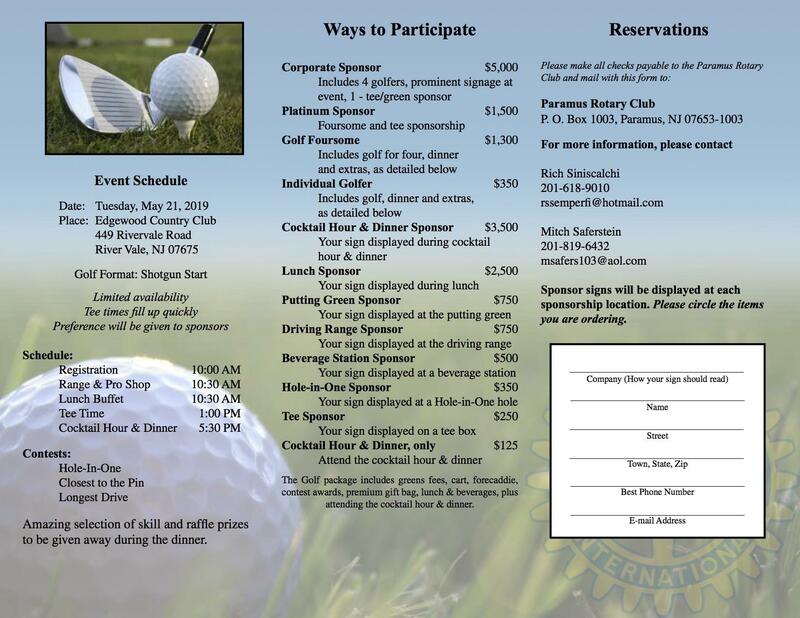 I have attached this years Golf Brochure and our solicitation letter, please use these materials to assist you in recruiting sponsors, donations, Golfers or guests to attend the dinner. As you all know these next few fundraisers are where we raise the bulk of our funds and they provide the greatest support to all those causes that we so proudly support year after year. We need all Rotarians to participate in order to make this the continued success it is for our club. Thank you in advance for your continued support and dedication to our Club and those we serve both locally and aboard.